Greetings fellow humans! We are nearing the end of our first month, and hopefully no one has tried to throw their computers at a wall yet. Remember, CSUS is a safe space, which means that flying computers are highly discouraged. My name is Liam Schoepp and I am your VP communications. From now on, I will be the guy doing the newsletters and letting all of you lovely people know what is going on. First off, I would like to thank all of you who came to our first meet and greet! It was great getting to know you guys, and we hope you had as much fun as us executives did! Before we get into our events, did you know that we have an instagram? No? Well we do! (And if you did I am very impressed that you found out). 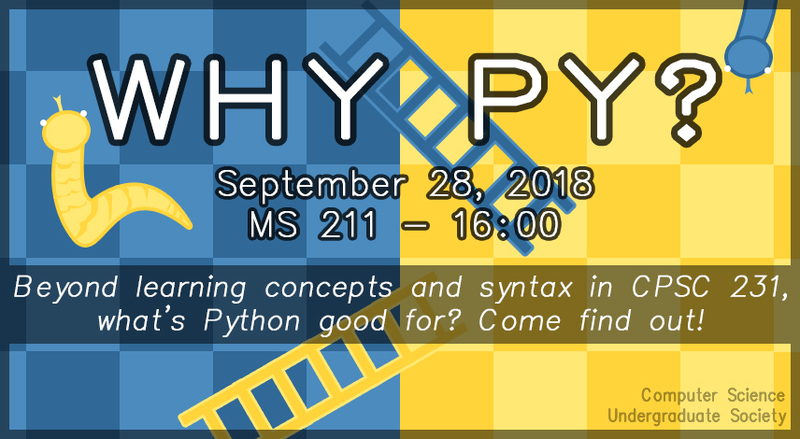 For our first event, we would like to remind you that this Friday we have our first academic event, Why Py? Have you ever wanted more advanced knowledge of a language that you might never use after your first year? Well, in case you do, this course is for you! Join us at MS 221 at 16:00pm for a fantastic journey into the wonders of Python. We got mail, and it has to do with you! The IEEE UCalgary Computer, Robotics, and Automation Student Branch Chapter is hosting the IEEEXtreme 12.0 Programming Competition. It is a global challenge where teams of (up to 3) IEEE Student members compete to solve challenging programming problems in a 24-hour time span. There is a limit of two graduate students per team. Prizes include an all-expenses paid trip to any IEEE conference anywhere in the world for all members of the winning team, valued up to $10,000. The contest will start on Friday, October 19th at 18:00 p.m. in ICT 319/320.Food and drink will be provided during the event. We hope to bring in students from Computer Science, Software Engineering, and Electrical Engineering. All are welcome! The Computer Science Alumni have invited you to join Joel Reardon to analyze various downloadable apps and their compliance with the Children’s Online Privacy Protection Act (COPPA), one of the few stringent privacy laws in the U.S.
Based on his automated analysis of popular free children’s apps, he has found that a majority perform actions that are possible violations of COPPA, due to their use of third-party software development kits (SDKs). While most of these SDKs offer configuration options to respect COPPA by disabling tracking and behavioural advertising, data suggests that a majority of apps do not make use of these options. We hope that you can make it, and if you have any questions, you can contact Leanne Marriott at scialumni@ucalgary.ca. We have been contacted by a university program called Innovation 4 Health. They pair aspiring innovators with real-world challenges faced by healthcare professionals with the intent of creating solutions and encouraging startups in healthcare. The program occurs in October, and consists of 3 events where participants get to network with other innovators, learn about real-world challenges, form teams, and design a solution in a 72 hour makeathon styled event at the university. On top of that, they are offering $20,000 in awards to the top teams of the competition so that they can continue with their design. You can learn more about this program at www.innovation4health.com. The best part? Participants don’t need prior experience in healthcare and/or prototyping to sign-up, as they are hoping to recruit a diverse group of talent! Although this isn’t exactly directly connected to what we do as computing science students, it seems like a fantastic way to apply your skills in a different environment. The deadline for applications is September 30th, and the program itself is completely free! Definitely check it out if you have some interest in the medical field. Have you ever wanted to mentor someone? If so, then look no further than IgniteCS. They are a group of students that are passionate about technology and strive to teach others about this awesome world. As mentors, they aim to teach incoming students how to code in order to introduce them to software and cultivate the same passion that they have for it. They have contacted us as they are currently seeking volunteers to join the mentoring team, and if you are interested in showing that you actually did pay attention in class, then you should give this some thought. Applications close on December 18th at midnight, so you have some time to mull over if you have time for that along with that one assembly program you have been putting off for the last few weeks. Curious about innovation and entrepreneurship at the University of Calgary? Register today and become a part of the University of Calgary’s innovation community by participating in this year’s Innovation Reactor Program. The Innovation Reactor Program has been designed to provide students (undergraduate, graduate and PhD), as well as post-docs, with an accessible and supportive environment to explore the world of innovation. 1. Mixers where you can meet new people and explore ideas around innovation. This social event provides a fun and easy going setting that lends itself to interesting conversations and eye-opening discoveries. As a participant, you can expect to take part in engaging discussions about world challenges and new technologies and to learn about new programs and services that are available to support student learning and development. Participants will also have a chance to begin forming teams for the month-end BIG IDEAS Hackathon – that offers a chance at $10K in innovation grants. 2. Innovation Resources such as lab tours and guest speakers, give you access to some of the incredible innovation spaces on campus and expertise from innovative speakers. 3. BIG IDEAS Labs are hackathon-type events which can help you to kick-start your ideas. BIG IDEAS Labs provide students, from across campus, with a forum to share ideas, form interdisciplinary teams, and begin building out ideas with the help of mentors. At the end of the event, teams will have the chance to pitch for up to $10K in innovation grants. The winners will also receive direct support from the Innovation Reactor partners to help with moving their projects forward. Below is a list of upcoming events. Be sure to check them out, and to keep checking the Innovation Reactor webpage for updates. The event is free. Registration is required. Register NOW! Date:Friday, November 2nd and Saturday, 3rd, 2018. The event is free. Registration required. Please Here. Still not sure if this is for YOU? Why not start by attending out October 17thInnovation Reactor Mixer and see if this program is a fit with your current goals? That might be a lot to read, but it definitely is pretty interesting. If anything above has caught your eye, or you just want more information without having to read, then you can attend the October 17th Innovation Reactor Mixer from 17:00 – 20:00 pm at the Last Defence Lounge – Red and White Rooms, 350 MSC. Finally, don’t forget that the department of computer science is in the process of revising the curriculum. They would like around 10 to 15 representatives to get involved in the process to get ideas and feedback about the curriculum. If you think that you might be busy with schoolwork and life in general, don’t worry, as there will only be two meetings. One in October and another close to the end of the semester or the next semester, for two hours. If you are interested in becoming a representative, you can e-mail us at csus@ucalgary.ca or drop by our office and tell one of the execs. Remember, we are located at MS 130 and no, we are not the ski club (you would be surprised how often we get asked that).